One of the books I am reading this summer has a connection to St. John’s, and I commend it to you. 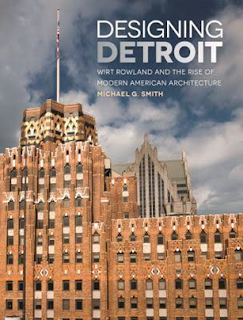 Designing Detroit was published this year by Wayne State University Press, and is a fascinating read. It is a biography about Detroit architect Wirt Rowland. If you say the name Wirt Rowland to the casual Detroit architecture/history buff that name will most likely mean nothing. But if you say Albert Kahn their eyes will light up with interest. Yet many of the buildings attributed to Albert Kahn were designed by his company, Albert Kahn Associates, and in fact were designed by Wirt Rowland! He also designed for famous Detroit firms/architects George Mason, Malcomson & Higginbotham, and for Smith, Hinchman & Grylls. Some of the buildings primarily designed by Rowland include the Buhl Building, Penobscot Building, The Guardian Building, The Detroit News Building, and the original General Motors headquarters on Grand Boulevard. He also designed dozens of schools, public utility buildings, and libraries. He was self-educated in architecture and was described as a veracious reader, although he did take two classes at Harvard when he was 32 years old and had already been working in the business for over 10 years. As far as churches go, he designed Jefferson Avenue Presbyterian Church (1926), and the original plans for Kirk in the Hills in Bloomfield Hills (1936), which were used after his death to complete it in 1958. He was also an accomplished singer who sang professionally at Temple Beth El (now the Bonstelle Theatre) and Central Methodist next door to St. John’s. He performed with The Players men’s theatrical group, which is still in existence on Jefferson Avenue, and with The Tick Tack Club, an architect’s acting troop. 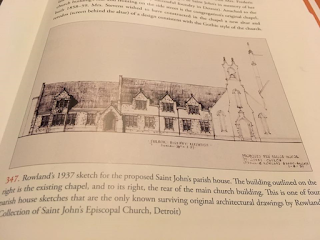 Our connection to Wirt Rowland is that he was the architect hired by the St. John’s Vestry to supervise the 1936 to 1937 move of St. John’s for the widening of Woodward Avenue. Rowland proposed several different plans while the vestry haggled with the State of Michigan over the settlement to pay for the moving of our building. One suggestion was to remove a section of the church, making it smaller and square, and moving back the façade, as did Central Methodist. But when the settlement was reached there was enough money to move the entire chapel and church back 60 feet onto a new foundation. Rowland supervised the deconstruction and re-construction of the bell tower, as well as the safety of the move itself. Other tasks included rearranging the seating around the new steel beams now plastered to look like pillars to support the roof, installing new lighting because alternating current was finally available in the neighborhood, and the commissioning of a new altar and reredos in the chapel in memory of the Oziah Shipman family. Author Michael G. Smith spent time doing research here at St. John’s, and I was pleased to share with him blueprints we had for a parish hall building never built by us, the plan’s existence unknown to Smith until that time. He also read through our Vestry and Building Committee minutes from those years and the correspondence with Rowland that we had on file. I have read through those minutes as well, and can assure you that the long-time deliberations and multiple plan changes we are experiencing in our renovation plans for the undercroft and office building are nothing new! Our current office “box” on the back of the building is a much later, 1970, addition because we did not build Rowland’s plans in 1937. I pray that we will be as inspired in our current plans as the parish, vestry, and architect were in 1935 to 1937 to build what is good, holy, beautiful and functional for the coming decades of ministry. Even if you are not a history or architecture buff, I commend this book to you. The book is available for sale on-line and at the Wayne State University’s bookstore.